Frank Schmalleger, PhD, is Professor Emeritus at The University of North Carolina at Pembroke, where he also was recognized as Distinguished Professor. Dr. Schmalleger holds degrees from the University of Notre Dame and The Ohio State University; he earned both a master’s (1970) and a doctorate (1974) in sociology, with a special emphasis in criminology, from The Ohio State University. From 1976 to 1994, he taught criminology and criminal justice courses at The University of North Carolina at Pembroke, and for the last 16 of those years, he chaired the university’s Department of Sociology, Social Work, and Criminal Justice. As an adjunct professor with Webster University in St. Louis, Missouri, Schmalleger helped develop the university’s graduate program in security administration and loss prevention and taught courses in that curriculum for more than a decade. He has also taught in the New School for Social Research’s online graduate program, helping build the world’s first electronic classrooms in support of distance learning through computer telecommunications. 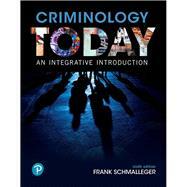 Schmalleger is the author of numerous articles as well as many books: Criminal Justice Today: An Introductory Text for the 21st Century (Pearson, 2016), now in its 14th edition; Juvenile Delinquency, 9th edition (with Clemmens Bartollas; Pearson, 2014); Criminal Justice: A Brief Introduction, 11th edition (Pearson, 2016); Criminal Law Today, 6th edition (Pearson, 2016); Corrections in the Twenty-First Century (with John Smykla; McGraw-Hill, 2015); Crime and the Justice System in America: An Encyclopedia (Greenwood Publishing Group, 1997); Trial of the Century: People of the State of California vs. Orenthal James Simpson (Prentice Hall, 1996); Career Paths: A Guide to Jobs in Federal Law Enforcement (Regents/Prentice Hall, 1994); Computers in Criminal Justice (Wyndham Hall Press, 1991); Criminal Justice Ethics (Greenwood Press, 1991); Finding Criminal Justice in the Library (Wyndham Hall Press, 1991); Ethics in Criminal Justice (Wyndham Hall Press, 1990); A History of Corrections (Foundations Press of Notre Dame, 1983); and The Social Basis of Criminal Justice (University Press of America, 1981). He is also the founding editor of the journal Criminal Justice Studies (formerly The Justice Professional). Schmalleger’s philosophy of both teaching and writing can be summed up in these words: “In order to communicate knowledge we must first catch, then hold, a person’s interest — be it student, colleague, or policymaker. Our writing, our speaking, and our teaching must be relevant to the problems facing people today, and they must — in some way — help solve those problems.” Visit Schmalleger’s Amazon author page at: http://amazon.com/author/frankschmalleger. Follow his tweets @schmalleger.